I was nervous I'd have a massive breakout for my conference which wouldn't have helped my confidence but in the end it was a mild on the chin outbreak (those I can handle and cover better than my cheek outbreaks). Adult Acne is something that really dents your ability to interact and I used to hate some baby groups for fear everyone was starring at my spots! I've tried the pill to control it but they sent my crazy hormones into overdrive and I wasn't happy with how they made me feel mentally. So I kept the bad skin. I've tried all sorts of cosmetics and skin care and they would work for a while and then my problems would revert back to before. Lately I've found a group of products that seem to be working for me. I've liked Liz Earle products for about 10 years now, using the Cleanse and Polish daily. I often get drawn to new products for a few months but always end up going back. I like how it makes my skin feel. You use a hot cloth to remove it and this also feels fairly luxurious on my skin. Superskin concentrate has been my real saviour. I never used to like it, in fact I thought it was overrated and made for old ladies. Guess what, I'm now that old lady! I love the stuff, every morning and evening I roll it on to my problem areas and it has changed my skin in recent months. It can come across as greasy so you have to use it sparingly and I admit it might not be for everyone but its helping to repair my damaged skin (got this from Liz Earle online - or from John Lewis). Water - my new bobble bottle. This is so great, I've always known I needed to drink more but this acts as a visual reminder and I do drink loads, plus the water is filtered as you drink it - which helps my skin. I take it everywhere (and filters last about 3 months at a time). 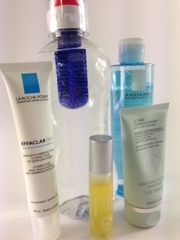 La Roche Lotion Apaisante - this toner is billed as 'physiological soothing toner'. It does soothe my skin, some toners leave my skin feeling tight but this glides on and I feel fresh afterwards. It removes any residue of dirt on my skin and doesn't feel like I've used anything harsh.